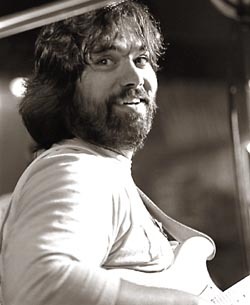 Best remembered as the de facto leader of the classic American rock band, Little Feat, Lowell George's distinctive style of slide guitar and vocalizing helped create a style of music that was a unique blend of second-line funk, gospel, Chicago blues, jazz and country balladry that still stands today as one of the most unique developments in American popular music during the 1970's. George was born in Hollywood, California on April 13, 1945. His father, Willard, was a prominent furrier to many Hollywood movie stars and the family's close friends included such notables as Errol Flynn and W.C. Fields. One can only imagine the deep influence that a character like W.C. Fields must have had on a young Lowell George. It's interesting to note that, throughout his career, Lowell George displayed a sense of humor that lent an air of surreal spontaneity to his music. This element of humor crops up in the multi-syllabic wordplay of George's song lyrics and on Little Feat's offbeat album covers that featured the bizarre and often comic artwork of the artist Neon Park. Van Dyke Parks, in The Little Feat Saga, Bud Scoppa's informal biography that was part of the definitive Little Feat CD box set, Hotcakes & Outtakes, states that, "Lowell was an absurdist. He would do things for the wrong reasons. I think he had the audacity of a schizophrenic, which I associate with great work, whether it's Van Gogh or Ravel. "Fatman in the Bathtub" –that's Cartoon Consciousness. You see the physical comedy in Lowell George that you get out of Buster Keaton. It's the tragicomedy of man in crisis – that's what Lowell did..."
At an early age, George's interest in music was encouraged by his mother, Florence, who was an accomplished pianist. Lowell's first instrument of choice was the harmonica which he took up when he was five years old. His first public musical performance was on the locally televised Al Davis Talent Show where he played a harmonica duet with his brother Hampton. Also appearing on the same show was another young musician named Frank Zappa. Apparently, both Zappa and the George brothers lost out to a girl tap dancer. Lowell attended Hollywood High where his classmates included Paul Barrere (later to become the rhythm guitarist in Little Feat), his future wife Elizabeth and Martin Kibbee, who went on to be a lifelong friend and co-writer with George of such Little Feat classics as "Fatman In The Bathtub," "Dixie Chicken" and "Rock and Roll Doctor." Around this time, George's brother departed for a stint in the army, leaving behind a classical guitar that the enterprising Lowell soon mastered. George also became proficient on a number of other instruments as well; the banjo, clarinet and a Japanese bamboo flute known as the shakuhnachi. Within the next two years, Lowell would also study a popular sixties instrument known as the sitar at a Los Angeles school run by Ravi Shankar. In some of Lowell's work with Little Feat, such as "The Fan," one can detect traces of Middle Eastern music so his studies under Shankar seemed to have had a lingering effect on his musical sensibility. By the end of high school, George's interest had turned to jazz. Martin Kibbee, in Mark Brend's comprehensive biography of Lowell George Rock And Roll Doctor (Backbeat Books, 2002), describes Lowell's developing love for music, "His taste in music at that time ran more to West Coast Jazz than, say, Jan and Dean or the Beach Boys. Les McCann and Mose Allison were appearing at Sunset Strip clubs like The Bit and The Renaissance where we hung out. Lowell wore a black turtleneck, the whole beatnik bit…"
Following high school, George attended Valley Junior College where he studied art history. While attending college, George held a job as a gas station attendant. In later years, he credited this experience with providing the inspiration for his future country styled trucker anthem "Willin" which is, perhaps, the most widely known Lowell George song. By the mid-Sixties, George had purchased a Fender electric guitar and an amplifier. After seeing the Byrds perform at The Brave New World coffeehouse, he decided to form his first band, The Factory. In Rock & Roll Doctor, Brend describes the Los Angeles music scene that confronted the young musician: "In the mid-1960's, the United States was teeming with newly formed young bands.. It was against this backdrop that countless young Americans grouped together in garages, plugged their Fender Mustang guitars into Vox amplifiers and ripped through 'Hey Joe'… Most of these so-called garage bands were musical primitives with more enthusiasm than dexterity, destined to play their local circuit for awhile and maybe record a demo that would appear on a collector's compilation decades later..."
The Factory was Lowell George's first serious attempt at carving out a career for himself in the music business. Consisting of Martin Kibbee (bass), Martin Klein (guitar), Richie Hayward (drums) and Lowell George (guitar, lead vocals and assorted instruments such as flute and clarinet), the band soon established itself on the Los Angeles rock club circuit. As to what this group sounded like, the best existing artifact to check out is Lightning Rod Man, a collection of tracks recorded for the Uni label in 1966. As evidenced by such tracks as "Lost," "Candy Cane Madness" and "Smile, Let Your Life Begin," the music of The Factory reflects a late-sixties folk-punk rock style as championed by such LA bands as Love, The Music Machine and The Seeds. Towards the end of 1967, things were winding down for The Factory. They had been a mainstay of the club scene and had even appeared in episodes of the popular television sit-coms F-Troop and Gomer Pyle but they had failed to create any hit records. One of their last projects was to record two demo songs for the Original Sound record label that were produced by Frank Zappa. These two tracks, "Lightning Rod Man" and "The Loved One" (both included on the Lightning Rod Man CD) contain familiar Zappa production elements. Actually, it is on the track, "Lightning Rod Man," that Lowell George hits his first serious stride as a musician. Written by George and Kibbee and based on a Herman Melville short story, "Lightning Rod Man" finds George delivering a tour de force vocal in a style that recalls the early work of Captain Beefheart. In fact, before this track had been properly identified as a recording by The Factory, many collectors assumed it was a rare Captain Beefheart outtake. George's brief time in the studio with Zappa apparently had quite an influence on the young musician as his later work as a producer of Little Feat records would indicate. Like Zappa, he adopted studio work habits that involved staying in the studio for several nights running and not leaving until a particular track was finished to his satisfaction. While the remaining members of The Factory formed a new band called The Fraternity of Man, George found himself working as a hired gun for The Standells, who were running out their proverbial 15 minutes of fame after the success of their hit "Dirty Water." In a 1975 interview in Zig Zag magazine, George described his experience with The Standells, "I replaced Dicky Dodds, the lead singer. …he quit because he couldn't stand it. And I finally quit because I couldn't stand it either." In his typical style of going from one extreme to another, George left The Standells to become a member of Frank Zappa's Mothers of Invention, the most cutting edge rock band at that time. Lowell's brief tenure in The Mothers lasted about a year. While George expressed his frustration at working within the strict framework of Frank Zappa's musical vision, it seems that he did come away with the firm knowledge of how to be a bandleader. Brend explains in his book how George's time in the Mothers of Invention provided him with a template for how he would run his future band, Little Feat: "George saw in Zappa's management of the Mothers a model of how a band could be run. It was a model that worked, that was productive, and that allowed for individual creativity – but within the clear boundaries set by the bandleader. This idea of how things might be was to stay with him throughout his career." Another important influence that Zappa had on Lowell George was in song composition. While in the studio with the Mothers, George no doubt witnessed Zappa's penchant for cutting up various musical parts and splicing these taped elements together, thereby creating entirely new song sections. George would go on to adapt this style of songwriting within a short time. On more than one occasion, George would refer to his songs as "cracked mosaics." Years later, in a 1975 interview in Zig Zag magazine, George would state, "I use tape like someone would use manuscript paper." All of this sheds light on how crucial George considered the recording studio as an essential tool that was needed for songwriting. Like Zappa, George eventually got so comfortable in the recording studio that he would create spontaneously, no matter how long the sessions ran and no matter how much the end result cost. These work habits would have a serious impact on Lowell's health towards the end of his brief life. After touring and participating in several recording sessions, it is unclear whether Lowell was asked to leave the band because of Zappa's intolerance for drug use or if the young guitarist had just felt it was time to leave and start another band. At this time, George had also composed one of his best known songs, "Willin" and, as a tape of the song was circulated among various record labels, Lowell began receiving offers to make his own record. In any event, George departed The Mothers just prior to their 1969 tour of Europe. His musical contributions to this era of The Mothers of Invention are featured on the albums Weasels Ripped My Flesh and Burnt Weenie Sandwich. The confluence of events of the past year had set the stage for the formation of Little Feat; George had previously worked with drummer Richie Hayward in The Factory, he had met and played with Mothers' bassist Roy Estrada and the final piece of the musical puzzle fell into place when he struck up a friendship with Bill Payne, a talented young piano player who had been hanging around Zappa's office. In The Little Feat Saga, Payne describes the ideas that he and George shared concerning the musical direction of their new band, "We talked about the kind of band we wanted it to be. Should we have a horn section? What should the bass player play? Are we going to relegate ourselves to one style of music? We decided there shouldn't be any limits to what we would do. If we wanted to play a waltz, great. If we wanted to play a straight-ahead song, fine." This mindset is obviously one of the key ingredients that led to the many stylistic innovations that characterized the music of Little Feat. As the 1970's began, the music scene began to change. A less-is-more approach replaced the extended jam format popularized by such bands as Cream and Iron Butterfly. The Byrds cut their seminal country rock opus Sweetheart of the Rodeo, Dylan released the mellow Nashville Skyline, and Gram Parsons formed The Flying Burrito Brothers. The most important group of this period was Bob Dylan's former backing combo, The Band, whose Music from Big Pink literally redefined popular music overnight. In the midst of all of this, after submitting a demo tape of "Willin" to Lenny Waronker of Warner Brothers, Little Feat was signed to a recording contract. They joined a roster of such eclectic artists as Arlo Guthrie, Van Dyke Parks, The Youngbloods, Deep Purple, James Taylor, Van Morrison, Joni Mitchell, The Fugs and Neil Young. The Little Feat album contained a wide variety of musical influences. Among the various styles represented on this first album are country rock ("Strawberry Flats"), mid-tempo FM radio rock ("Hamburger Midnight Blues"), tinges of lysergic psychedelia ("The Brides of Jesus" and "Got No Shadow") as well as the Howlin Wolf covers, "44 Blues" and "How Many More Years." I consider these last two tracks to be some of the most important recordings in the Lowell George canon. They reveal the most primal of George's musical influences. Howlin' Wolf proved to be such a consistent presence within George's music that Lowell would soon compose his own version of a Howlin Wolf song ("Apolitical Blues") and, if you listen closely, you can detect the Chicago blues style of Wolf sprinkled throughout many Little Feat recordings. In addition to these benchmark tracks, the album is notable for producing the first of many versions of Lowell's country rock classic, "Willin." In another example of his developing obsessive qualities in the recording studio, George would insist on including different versions of "Willin" on various Little Feat albums. While Little Feat had a sparse quality about it, some of the enduring musical elements that defined Little Feat were already in place in the form of Payne's effervescent keyboard work, George's unique singing style as well as his slide guitar work. The story of how Lowell George came to develop his unique style of playing slide guitar has a mythical quality about it that stands as a good example of just how accomplished a musician he had become by this point in time. The day before Lowell was supposed to start recording his guitar parts for the first Little Feat album, he was sitting at his kitchen table pursuing one of his lifelong passions – working on model airplanes. While adjusting the motor in one of the planes, he sliced open his hand on the tiny propeller. Since the hand that he injured was the one that he used to pick out notes on his guitar, he opted to employ the slide guitar style while overdubbing most of his guitar parts for the record. Rick Harper, Lowell's close friend and road manager, sheds more light on this incident in The Little Feat Saga, "He never told anybody... he'd lost the feeling in two or three of his fingers. He said at first it was like marshmallow and he couldn't tell how much pressure to put on the strings." It is indeed remarkable that George was able to overcome the results of his accident and discover a new way of expressing himself musically. George had already dabbled in this style of playing guitar while with the Mothers of Invention but being forced to play using a slide for an extended period of time while his hand was healing probably led to the discovery of his own singular style of slide guitar playing. Lowell quickly developed his own "sound" which featured clean compressed notes played with precision and filled with sustain. Along with Lowell's unique slide guitar, he was also developing a distinctive vocal style which employed the technique of melissima by which the singer melodically embellishes certain syllables within a phase. This style of singing, much like Lowell's slide guitar, would become a critical element of Little Feat's musical identity. While the first Little Feat album did a good job of illustrating the talents within the band, it sold poorly and the group was in danger of being dropped from the Warner Brothers label. Fortunately, Van Dyke Parks interceded on their behalf and convinced the label executives to let the band record a second album. Recording on their sophomore effort, which was initially supposed to be titled Thanks I'll Eat It Here but later changed to Sailin' Shoes, began in the spring of 1971. The album indicates how quickly Little Feat was developing musically. The record features two songs ("Trouble" and "Texas Rose Cafe") that reflect George's absurdist sense of humor. Among the record's other highlights are Lowell's homage to Howlin' Wolf ("Apolitical Blues") and the anthemic "Tripe Face Boogie" which features the most incendiary slide guitar solo ever recorded by George. During this solo, Lowell's technique with the slide is electrifying as he coaxes a series of high piercing notes on his guitar. As George's musical ability developed, so did his ideas on how his music should be presented to the public. The Sailin' Shoes record marks the debut of the distinctive Little Feat "look" which was created by the experimental artist, Neon Park. George had been exposed to Park's art while in the Mothers of Invention. Park created the infamous Weasels Ripped My Flesh cover on which a man is depicted using a live weasel to shave his face. Park's sense of absurd imagery appealed to George's own innate sense of dada art. The Sailin' Shoes cover, depicting a slice of cake on a swing, a phallic snail and a Mick Jagger inspired image of Gainsborough's Blue Boy, caused quite a stir upon the album's release. Starting with this second album, Park's art would adorn every subsequent Little Feat album cover and, even though Park passed away in 1993, his surrealistic imagery continues to be featured on every Little Feat record that is released to this day.